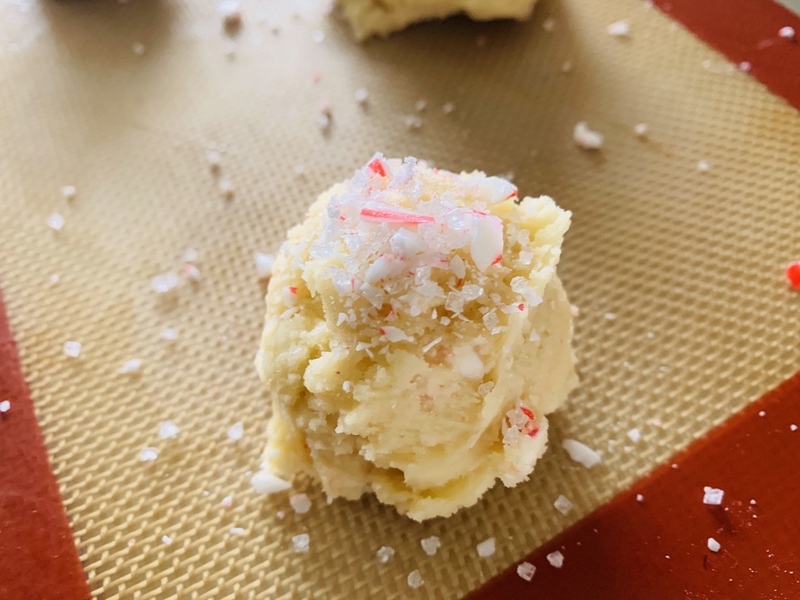 White Chocolate Peppermint Cookies - Recipe! - Live. Love. Laugh. Food. What better candy than peppermint says, “It’s Christmas.” Peppermint sticks, candy canes and drops whirled in red and white are representative of this time of year. 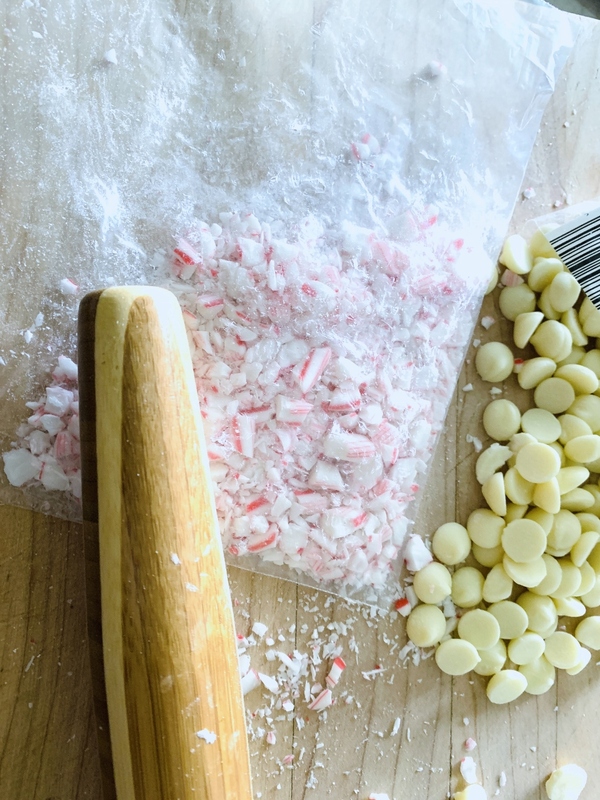 When it comes to peppermint, just a bit goes along way and it pairs nicely with chocolate, especially white chocolate. Drop cookies balled, baked and speckled with crushed peppermint flecks and white chocolate bring in good cheer. These delightful treats are perfect for Santa to nibble on while filling stockings or perhaps at a holiday gathering for friends and family. Children and adults alike can enjoy this most terrific Christmastime treat and they’re are prime for dipping into a hot cup of cocoa while enjoying yet another Holiday Classic on the Hallmark Channel. A basic vanilla dough encases the sweets in a buttery sort of way, but it’s the candy that turns this cookie into an elf favorite. 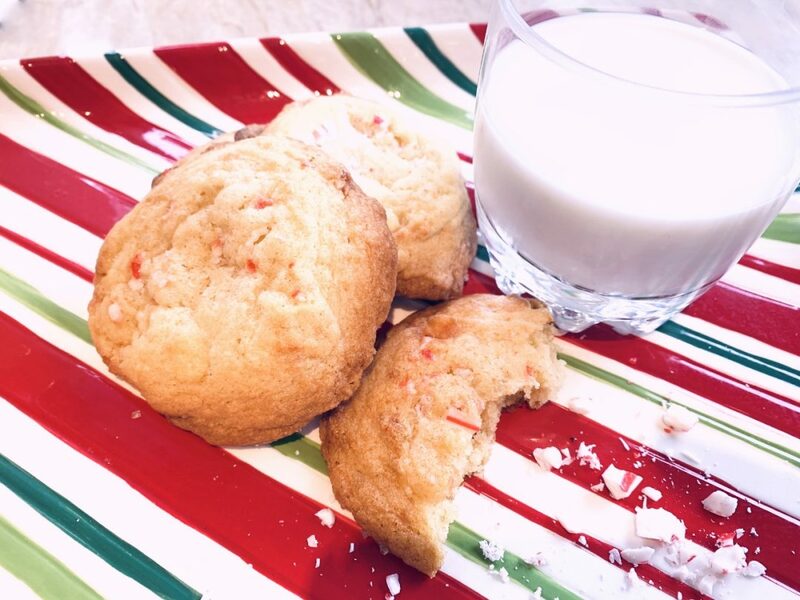 Soft centered with crispy edges make some of the best cookies during the season and if you freeze the scooped dough ahead of time, you can bake them off one-by-one so they’re hot and fresh when Rudolph arrives. Preheat oven to 350 degrees. In a stand mixer or large bowl, cream together butter and sugar for 3 minutes. 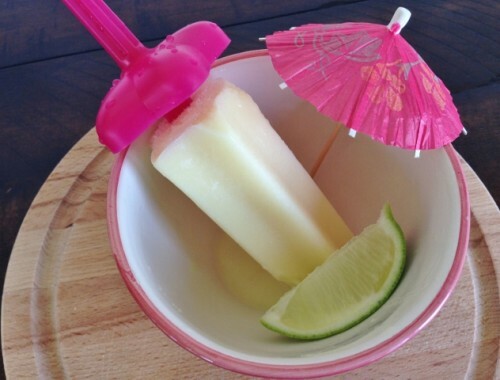 Scrape down sides of bowl and add eggs and extracts, mix for 1 minute. Add flour, baking soda and salt, mix on low for 1 minute. Remove bowl from stand and mix by hand until incorporated. Stir in white chocolate chips and all but, 1 tablespoon crushed candy canes. Scoop dough into 2 tablespoon balls onto parchment or silpat lined baking sheet. Sprinkle each ball with remaining candy canes. Place sheet pan in freezer for 10 minutes. Bake for 12-14 minutes or until light golden brown. Remove from oven and let cool for 5 minutes on sheet pan. Move cookies to wire rack to cool completely. Store in an airtight container for up to 3 days. Enjoy! 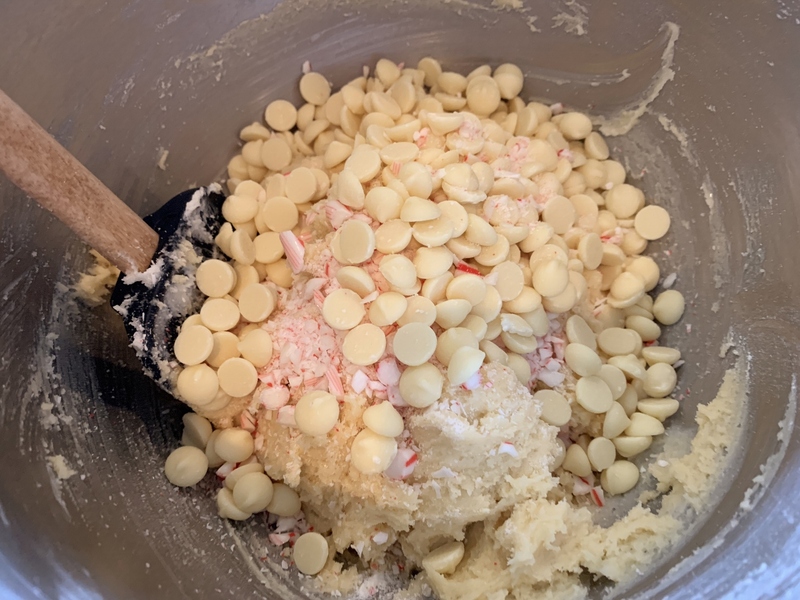 Baking with Gena Bellchristmas cookie recipescookie recipesHoliday BakingPeppermint RecipesWhite Chocolate Peppermint Cookies - Recipe! 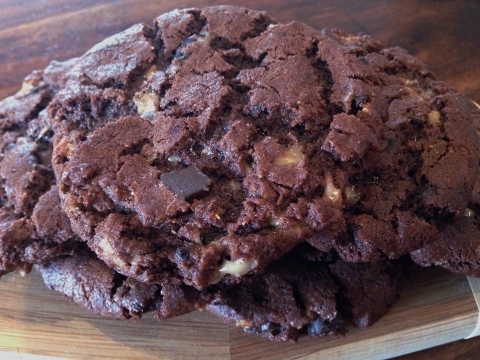 Flourless Chocolate Peanut Butter Toffee Cookies – Recipe! 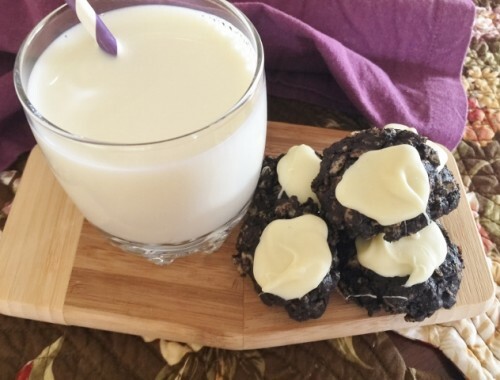 Inside Out Oreo Krispies – Recipe! A Modern Twist to the Oreo!